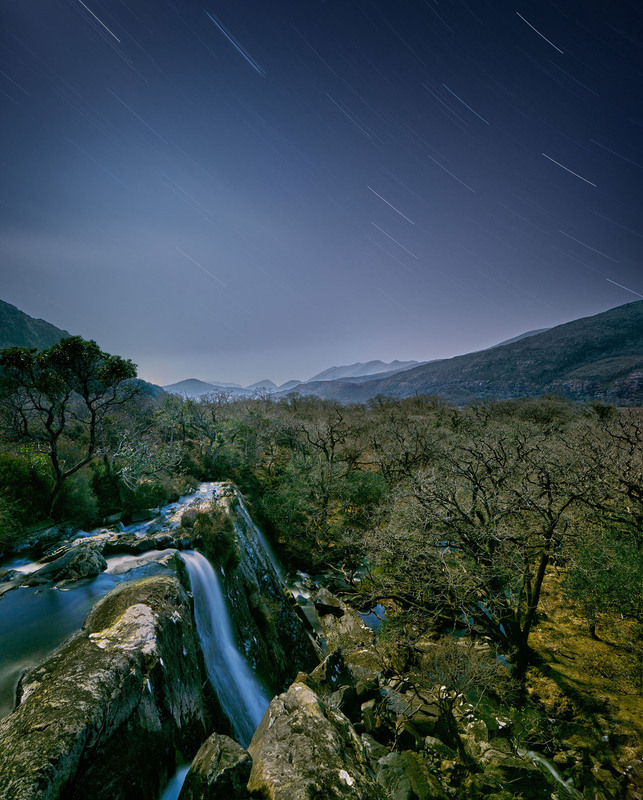 A moonlit image of Crinnagh waterfall on the river Crinnagh in Tower Wood near Killarney in Co. Kerry. Behind you can see the slopes of the Magillicuddy Reeks, the star trails are a result of the long exposure that is needed to capture this kind of photograph. A surprise for me when I first started taking this kind of photograph was how true the colour was. I had an instinctive impression that the night would be grey lit or blue, but the light of the moon is a nearly perfect reflection of the sun’s light, it is only the weakness of our eyes that prevents us from seeing the world in its full glory at night. Using long exposures like I have in this image allows the camera to capture all of that light and gives us access to a kind of vision which is beyond us. A big thank you to my buddy Norm McClosky for bringing me to the waterfall on a dark night. Otherwise I may still be up there.